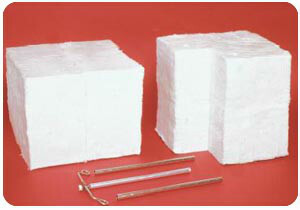 Pyro-Bloc | High Temp Inc.
Pyro-Bloc is a ceramic fiber block module made exclusively by Thermal Ceramics. High-Temp Inc has been a distributor of Thermal Ceramics for the past 30 plus years. We have the largest inventory for refractory contractors of every thickness, density and grade of Pyro-Bloc in the western states. Our employees have the expertise to advise contractors on all the installation techniques and the capabilityto help with design of your furnace project. Modules are available in “Y” style with interior mounting studs attached or “M” studs for heavy application where 3/8″ studs are required. Please call for pricing on all your furnace lining projects.